Preheat the oven to 350°. Heat oil in a medium skillet and sauté the garlic, onion, red pepper, and red pepper flakes for 2 to 3 minutes. Add the refried beans, drained tomatoes, chili powder and cumin. Mix thoroughly until the beans are hot, about 5 to 7 minutes. Evenly divide the bean mixture between the tortillas and roll up. Place the enchiladas seam side down in a baking dish. Mix the spaghetti sauce and salsa. Evenly pour the tomato sauce mixture over the enchilada. Evenly spoon the tofu ricotta over each enchilada. Bake for 30 minutes until the enchiladas are warm and the sauce is bubbling. 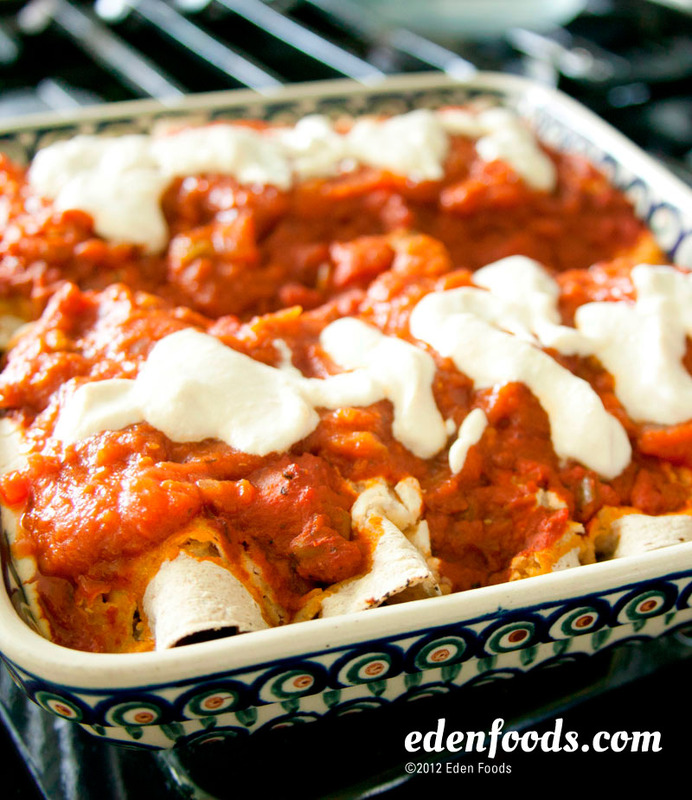 Serve 2 enchiladas per person.